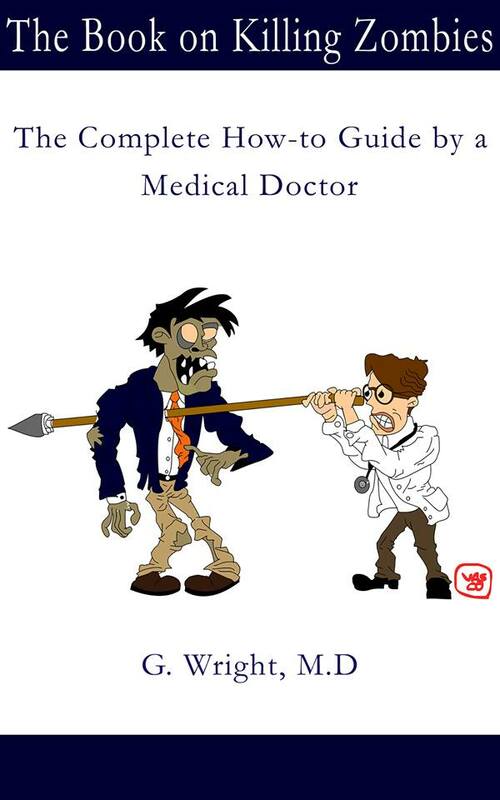 Could you tell me about yourself and The Book on Killing Zombies: The Complete How-To Guide by a Medical Doctor? Oddly enough, I write to relieve frustration. I learned a long time ago that I’m not a great writer of fiction, but I like to educate and instruct – especially in areas that involve science and facts. I can’t write a romance novel, but I could write a piece that can instruct a medical student how to do an endotracheal intubation or place a thoracotomy chest tube. That’s because I can’t develop fictional characters, but I can identify a problem, make an analysis, and give instruction on how to correct the problem. The bigger the problem, the more I seem to enjoy solving or correcting it. Could you tell me what the process is like? What inspired you to write The Book on Killing Zombies? What did you learn about yourself as you were writing The Book on Killing Zombies? What might your readers learn about themselves? I’m not sure that I learned much about myself when writing this particular book, but I think the readers learned that they aren't as helpless against supposed zombies attacks as they may have previously believed. I've seen a lot of zombie films. The laymen’s advice seems pretty cut and dry. Aim for the head. What does your book on killing zombies give to the zombie survivalist community? I was compelled by my own OCD to get the word out that, if the object is to kill the zombies's brain, then there are multiple ways to approach this. It really wouldn't necessitate a direct cerebral trauma as portrayed in folklore or revived pop culture. I took an approach using medical science to educate the reader to give them that intellectual edge over the guy at the bar who crushes beer cans with his head – not that I've never crushed a beer can with my head but its been a while. In essence, the individual who has digested the information from this book will be the same individual who people would theoretically turn to as a leader in the group by virtue of the fact that they have powerful knowledge to solve one of the most epic problems regarding the entire subject of zombies – how to stop them rapidly and effectively. It's sort of like asking yourself who you would turn to if you were stuck on an island, Gilligan or the Professor. There are plenty of decent zombie books out there for the Gilligans-types, but I wanted to write one for the Professor-types. I’m balancing book writing with clinical practice. Both can consume an inordinate amount of time. At present, the best way to stay on top of my releases is to just follow me on Twitter, Facebook and the Book Section of Amazon.com. There are times when it may appear that my social media pages are stagnate, but when you see that just know that I am slammed with what seems like avalanches of commitments. Many writers hire personal assistants or virtual assistants to maintain their social media pages daily. I don’t do that. To me it seems almost disingenuous to post something that’s really not my own thought or expression. Some writers may appreciate what I mean, while others may not give a damn either way as long as they create some sort of a semblance that they are “plugged-in” to their readers. If you see a new posting from me on social media or you see a new book release then you know that I was compelled, inspired, and caught up on sleep. Where are you selling your book(s)? Right now, it’s on Kindle but I plan a larger hardbound release through Smashwords soon, so keep a lookout for that.